Lady Warsi says she has written to Nick Clegg to discuss fraud and voter disenfranchisement. Photograph: Linda Nylind for the GuardianLady Warsi has blamed electoral fraud for the Tories’ failure to secure an overall majority at this May’s election – and claimed that Labour “absolutely” benefited from the alleged fraud. She said she had written to Nick Clegg, who is overseeing the coalition government’s electoral reforms, to discuss fraud and voter disenfranchisement. 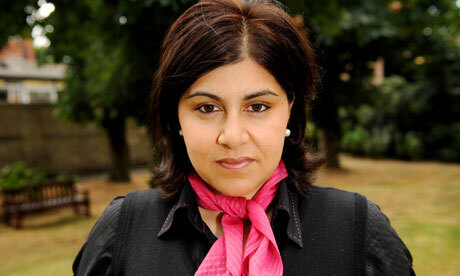 Warsi also launched an attack on the “anti-Islamic sentiment” of the British press, which she compared to the anti-semitism of the early 20th century. Asked about the views of Tory party members about the decision to form a coalition with the Lib Dems, Warsi said she “challenged” the members and told them “we didn’t win the last general election … so that means we are compromising all the time”.